You may remember another game called APB; it was released over a decade ago and played vaguely like the first GTA. With the second incarnation of the name, developer Realtime Worlds has created an MMO which has been marketed to seem like a persistent world version of Grand Theft Auto 4. It wouldn’t be a shock to many that this is, in fact, far from the truth, and it ends up being so disappointing that you’ll be hard pressed to use up the 50 hours of added free game time. When reviewing games it is a requirement to give something a fair chance no matter how dreadful it may seem in order to give an informed opinion. Let me tell you, APB felt by far the longest and most unfulfilling 24 hours of play time I’ve spent in an online game. In All Points Bulletin you play a citizen in the dangerous city of San Paro, you are aligned with either Criminals or the newly legalized Enforcer vigilante group. Your choice of faction does not house many differences, the Criminals are causing violence and stealing things, and the Enforcers are chasing them down and making the arrest. In what must be a shocking oversight by Realtime Worlds, there is no story to progress through, no statistical levels to grind and only a dozen missions to repeat ad nausea. The only hook to keep you playing is completing tasks for NPC quest givers which will in turn unlock new equipment and new vehicles. APB revolves entirely around player vs player interaction. Each mission a player picks up will attempt to match-make you with an enemy group of the opposing faction, you’ll not encounter AI controlled enemies at any time, and it’s either enemy players or nothing. Dying against the enemy on a mission yields no disadvantages (unless there is a frag limit) and you’ll re spawn 5 seconds later rearmed and ready to fight for the objective once again. If you are the kind of person who doesn’t like grouping with strangers, then you need to either ensure you have friends to play with or look away, if you attempt to solo the game will automatically group you up with others. Playing with friends can actually make APB rather enjoyable as long as you are cruising around in a police car chasing down the bad guys, but the fun, unfortunately, doesn’t last too long. The lack of impact a player has on the game world is astonishing, there is no territory war where you can compete for regions of San Paro, and you can only interact with the opposing faction when they are on the opposite mission, to hunt you down while you are hunting them. At points as an Enforcer you are tasked to raid a suspected enemy hideout, your character starts to smash on the door with a battering ram and you start to believe that the epic times are about to begin, that you will smash down the door run in and tazer anyone waiting on the inside. Unfortunately that doesn’t happen, and you end up being hugely disappointed once again when the meter reaches 100%, the door gets broken slightly and an item drops on the floor for you to pick up and take to the next objective. Perhaps if Realtime Worlds had improved the variety of missions and added an end goal campaign system then the faulty game mechanics could be overlooked. Even if you like repetitiveness or just look at the game as purely a open world third person shooter you will need to fight against an awkward combat system and balance issues with weaponry. Weapons and upgrades are purchased with in-game dollars that drastically shift the advantage you have over other players, skill counts for little in combat. If you have the dexterity to have the cross-hair over the enemy character the only real factor that comes in is how powerful your weapon is, and the guy with the NTEC-5 will likely be the victor. Of course that’s not the only money sink, you can spend currency on other things than guns: clothing and vehicles can be purchased as well and this is where APB shines the brightest. 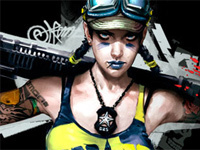 You’ll be hard matched to find a game that allows you to customize the look of your character as beautifully as APB. You can really give yourself a unique, awesome looking identity. If Realtime Worlds would have put half the amount of work they did in the character developer into the game mechanics, you would be looking at a blockbuster. The city of San Paro itself suffers from a series of poor design choices, dead ends at too many turns and small walls that can’t be jumped over, which causes frustration when trying to chase down a criminal on the other side of a three foot wall. You will be forced to traverse 100 meters until you find a climb point to get over to the other side. The city seems abnormally small, with only two action districts slightly bigger than an average Battlefield 2 map. When players aren’t being frustrated by San Paro or insulted by its lovely residents, who like to refer to everyone they meet as female genitalia, you can kick back in the Social District, a zone in which not that much socializing is done but instead acts as a hub where you can buy new weapons and customize your character, give yourself that bandanna that everyone else is wearing, you know you want to! 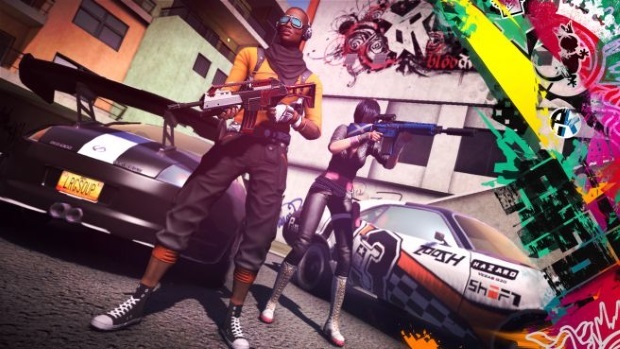 The concept of APB is a superb one, but Realtime Worlds were unable to execute it properly. With no goal, poor world design and subpar combat mechanics the only thing the game has going for it is the player customization to make you look as cool as possible in this static matchmaking world. – Subscription model of pay for hours.